Welcome to graduate school, where your summer break is one week long. How am I spending the last two days of that break (other than running 41 miles in those two days)? Writing a shoe review on a personal favorite of mine. Today we have the Brooks PureCadence 3 on deck. 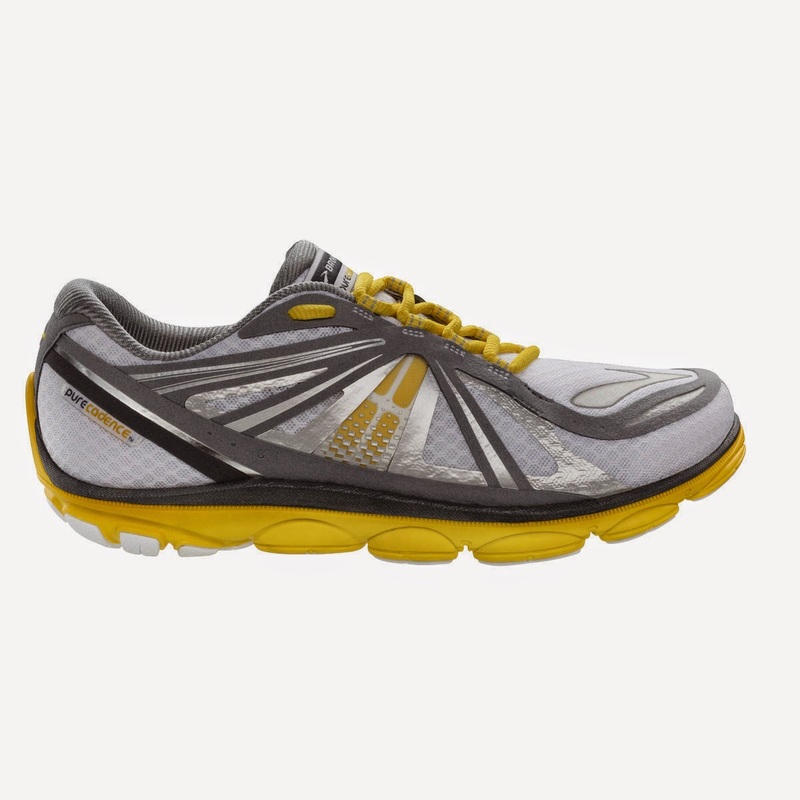 The Brooks Purecadence 3 is the supportive shoe of the 3rd generation of the PureProject line. It has a 5mm drop and weighs 8.4 ounces. My introduction to this shoe started with the original PureCadence and it was not love at first sight. In fact I thought the shoe was rather unremarkable when I first ran in it 3 years ago. I was frusterated with not being able to run in zero drop shoes due to an achilles issue that kept popping up (retrospectively I just need to stretch my calves, get some range of motion back, work on my peroneus longus strength and do eccentric calf raises. At that time I didn't understand any of what I do now). I was initially taken back by what I considered a narrow toe-box (keep in mind I was coming from Altra running shoes. So everything was narrow to me), but really liked the 4-5mm drop with mild, non-instrusive support. The toe-box thing stuck with me for a while until low and behold I stopped noticing it. By that time I had 400 miles in the shoe, retired them (even though they were fine) and attemped to move back into Altra shoes. They came into my radar last fall when I was again looking for a low drop, cushioned but mildly supportive shoe. I again went with the first version as the second version had a sloppy upper that was thick, stiff and uncomfortable. That combined with a sloppy, soft and unresponsive midsole turned me off to the second version. The first version (PureCadence 1) round two turned this shoe into a favorite of mine. It kept a peroneal issue at bay (again, working on all those adjustments I mentioned above has taken care of the issue) and was a wonderful balance of drop, cushioning, responsiveness, toebox width and more. I noticed the toebox was narrow at first, but adapted to my foot over about 30 miles. This was confirmed when I purchased another pair when I had 600 miles on the first of the two. Oh... and the durability? I've never gotten 600 miles out of a shoe before. I'm pretty hard on them and my prior record was a little over 400 on a pair of Brooks Adrenaline GTS 14. So yeah. The Purecadence 1s are a favorite. The durability, great cushioning, responsiveness for fartleks and tempo runs, adaptive/non-instrusive/full length support (I'll get into that later) and comfortable fit were great. So as the original disappeared, I decided to give the 3rd version a shot. I'm glad I did. Sole: The sole has recieved several wonderful updates. First of all this shoe has great grip in wet conditions, which is a first for a PureProject shoe. The entire first generation of the Pureproject shoes had next to no traction on any wet surface. Which is weird because Brooks is based in Seattle, Washington..... where there are 300 days of rain a year. Anyway, the issue has been fixed. In fact the new outsole has great grip on most terrain, even trail. That grip may come from the increased depth of grooves in the forefoot, which increases the flexibility of the forefoot as well as may act like large lugs (that are still nowhere near as effective as something like the Brooks Puregrit 2). 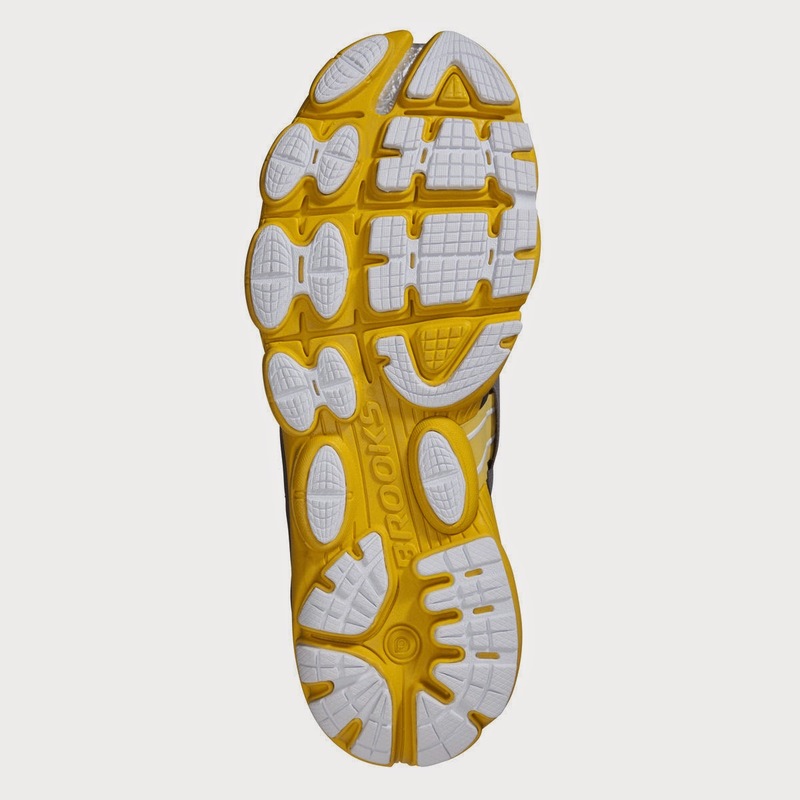 Despite less outsole, the white areas of the sole are highly durable. Just like the first generation, even after +200 miles there is not significant wear on the outsole. I expect to get many more miles out of this shoe before they are replaced (see the Durability section). The addition of a second medial bump in the midfoot gives the plateform a much more stable feel. This shoe just feels stable in general. Not forcefully stable, but adaptively stable. That's thanks to the full length Internal Progressive Diagonal Rollbar (PDRB). This provides mild support throughout the entire length of the midsole from the medial side. As I've discussed in early posts (particularly with the Altra Repetition. I will also discuss this further down in this post) I'm a really big fan of full length adaptive support. The PDRB definitely provides support when you need it and gets out of the way when you don't. The full length aspect will provide support in the forefoot, midfoot and heel as biomechanical collapses can occur at any of those three points (not just the midfoot and heel as most people and companies wrongly assume). The ideal heel in the third generation of the PureProject shoes has been significantly increased. This combined with a flexible forefoot and some appropriate toe-spring sets this shoe up for a VERY smooth ride. I don't think I've ever run in a shoe this smooth. The curved heel (which is what the ideal heel is) really takes the edge off of heel-striking landings as it progresses down from initial contact through midstance. It feels so good. I think this is a wonderful addition that may decrease the heel strike transient force associate with heavy heel striking gait. 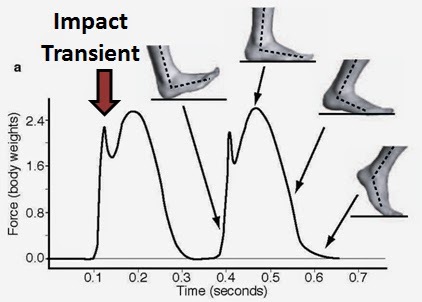 The heel strike transient (or impact transient) is the initial very high impact force that is seen with heel first initial contacts that signifies that sometimes jarring feeling throughout the lower extremity with a heavy heel strike. The ideal heel feels like it smooths that out and also models the shape of the calcaneus (the heel bone). Always look for a shoe that does NOT have a heel that juts out way behind the shoe. That will cause a premature initial contact and may increase joint forces and increase the work of your pretibial muscles (anterior tibialis, etc). And that is one of the reasons why many people get shin splints (I'll have a future post on that). So again, I love the ideal heel for many reasons, but the main one is that it makes this shoe SOOOO smooth. Like butta'. Upper: The upper is pretty thick in the PureCadence 3 but is nothing like the PureCadence 2. The second version had a rigid, plastic ridge in the upper around the toebox that refused to let it expand at all. This contributed to a very uncomfortable fit, which combined with the sloppy upper fit helped ruin that shoe for me. The PureCadence 3 has fixed that. While the upper is still thick, it does not have the plastic ridge in the forefoot. In fact, the shoe has really returned to the feel of the original with what appears to be a narrow-ish fit initially but is really just the thick upper conforming to your foot. 10-15 miles in the shoe did not feel narrow at all and felt like it had conformed to my foot. 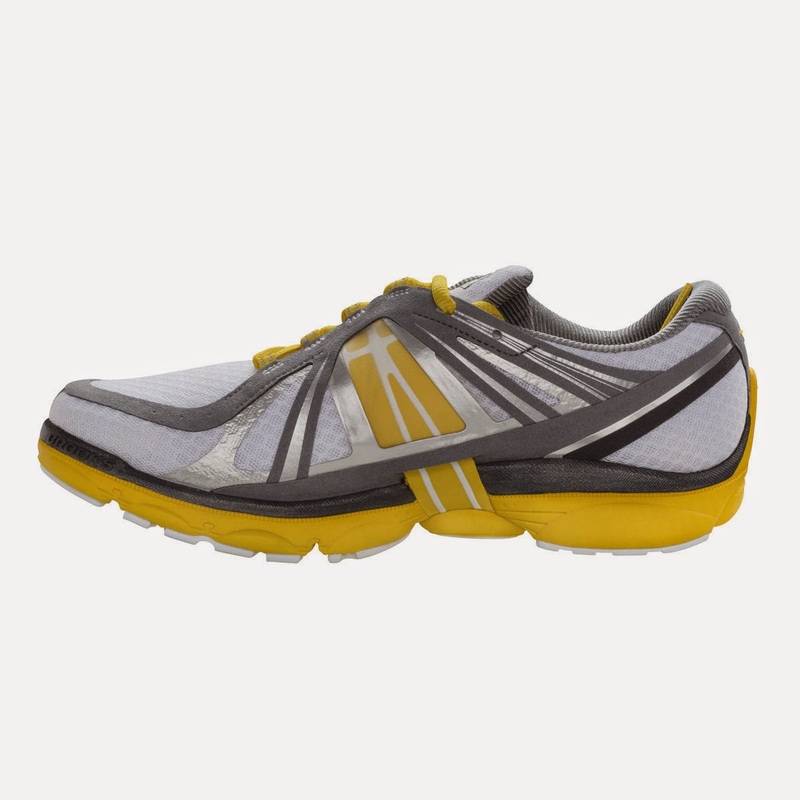 Most aspects of this shoe are what I would call adaptive, both fit and biomechanics wise. What worried me initially was how thick the heel counter is in the back of this shoe. It's pretty thick and rigid. This usually causes me severe discomfort and pain as my achilles insertion is fairly sensitive to those things. It was for this reason that I couldn't wear the Pureflow 3. The heel counter really bothered my heel and I had to return them. The Purecadence 3 solves this issue with heavy cushioning around the heel/calcaneus. I honestly do not feel the heel counter at all during running or casual wear. And again the thick cushioning molds to your heel after a few miles of wear. I do think the upper could stand to be a bit thinner up front, but that might compromise durability, which I have had zero issues with after +200 miles. The thick heel counter is offset by the thick calcaneal cushioning. The combination of those two may contribute to a more stable ride. And the newly design burrito upper? Awesome. 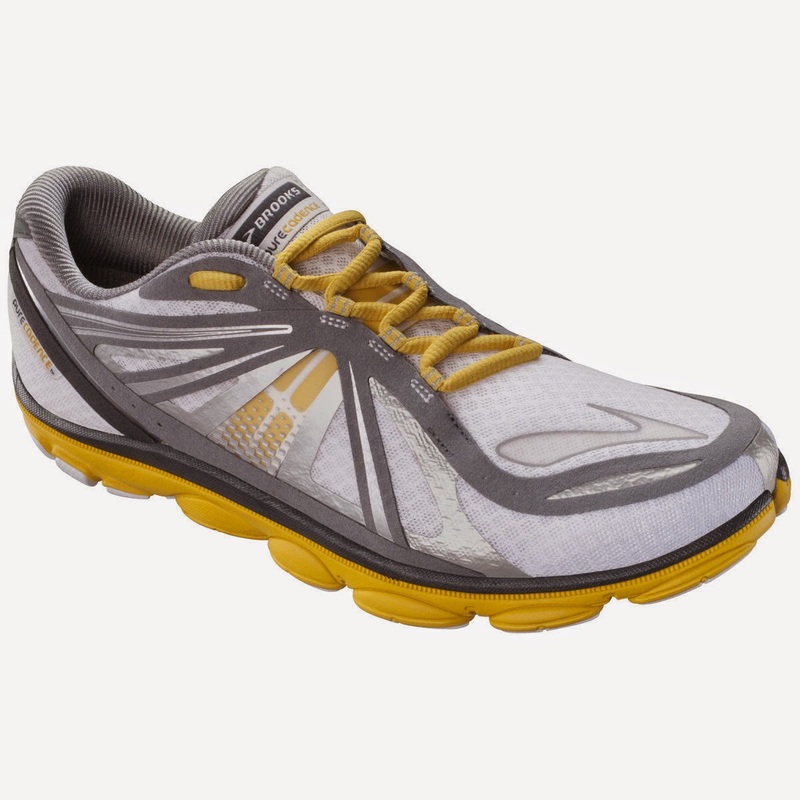 I have no idea why Brooks went the opposite direction with the 2nd generation of the PureProject shoes. The new design closely follows the contors of the foot and again contributes to a very close-to-skin feel. There is plenty of room for your toes in the shoe, but your foot will not move around due to the combination of the thick upper, newly designed burrito upper and the anatomic last. I cannot forget the controversial Nav-Band. That is the strap running around the mid-foot that is designed to help hold the foot on the plateform and assist with the anatomic lacing design (also something I like). Most people seem to hate the Nav-Band or think it's useless. I like it. There, I said it. I like the Nav-Band. I feel like it helps secure my foot on the shoe and really keeps my foot secure when I've picked up the pace during tempo runs and workouts. I do think that the prior versions didn't do as well, but Brooks has definitely done their homework and improve both the fit and function of the Nav-Band. Again, yes I think the Nav-Band not only works but is better than the previous generations of PureProject shoes. 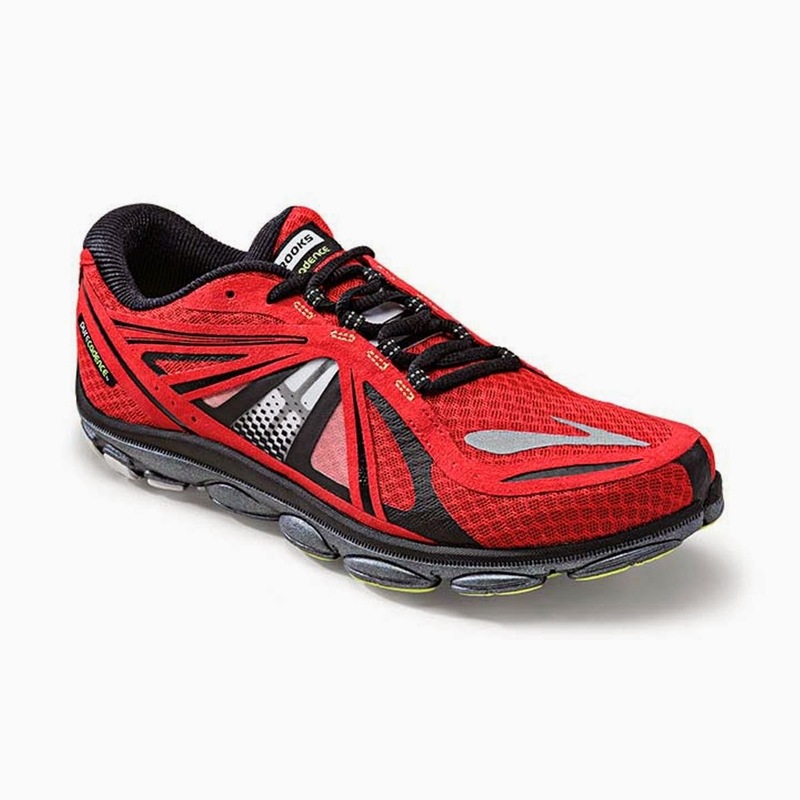 Responsiveness: Thanks to the Brooks BioMoGo DNA, this shoe has adaptive cushioning. And it's not just a marketing ploy. I have used this shoe from everything to 200m repeats (not the best shoe for that, but it works) to 8 mile tempo runs to 20 mile long runs. It does everything. There is plenty of cushioning combined with a responsive, lightweight and unhibited ride. I would probably save this shoe for long runs and tempo runs as the cushioning is a bit much and soft for short repeats. It can be done though. Heel-Toe Drop/Ramp: Despite the Pureproject shoes being listed as 4mm drop shoes, the actual drop varies. The PureFlows have always had very low drops of what feel like 2-3mm. The original pureconnect had what felt like a 4-5mm drop. The PureCadence line has always felt like it was in the 5-6mm range, which in my mind is perfect. Goldilocks style: not to much and not too little. This shoe is no different. Combined with the ideal heel (which again is awesome), the shoe offers a very smooth ride. Durability: Just like the first generation, the third generation of the PureCadence is very durable. I have a little over 200 miles on my current pair and they are going strong. I would expect another 300-400 miles out of this pair based on the feel and wear of the outsole. There is minimal outsole wear, the upper has absolutely no seems loose or signs of ripping and the sole feels the same if not better than when I first put them on. Durability wise, these are fantastic shoes for the money. Weight: The shoe feels just right weight wise. It's somewhere in the relm of 8.4 to 9 ounces, which seems to be a sweet spot for me for lightweight trainers. The PureCadence 3 never feels heavy and as I mentioned easily responds to faster workouts. At the same time, I am convinced that the ideal heel (the curved rearfoot portion) significantly contributes to the shoes lighterweight and smooth feel. I love this aspect of the pureline and hope that more companies start doing it. Thoughts as a SPT (Student Physical Therapist): I am a huge fan of the full length support. Most shoes only have some kind of support in the medial heel or midfoot. This shoe provides in throughout the entire medial length of the shoe. Most running and walking companies seem to completely forget about people who either pronate at the forefoot and/or have a forefoot varus deformity. This deformity can be due either to a weakness of the peroneus longus or other plantar muscles (technically only the tendon of the PL travels through the plantar area of the foot) or from a structural issue. Significant pressure can be taken off someone with this issue by providing support in the forefoot and bringing the ground (or the shoe) up to front medial arch rather than forcing the arch to try to fall down to the ground (again either due to a structural issue or a muscle weakness issue). The only other company that does this is Altra with the Altra Repetition and the Altra Provision (through a removal wedge in the shoe in the Provision). Newton did this with their support shoes up until the 2014 line when they returned their support to the medial heel and midfoot. Hopefully we will see more shoes with full length adaptive support in the coming years. 4-6mm drop shoes with anatomic fits and mild adaptive support shoes are perfect in my mind for the general population. I hope to see more shoes like the Brooks PureCadence 3, the Saucony Mirage line and the Asics Super-J33 on the market in the coming years from Nike, Adidas, Mizuno, New Balance and more. From what I've heard, the Purecadence line has been the most successful shoe in the pure series and I completely understand why. Final Thoughts: Brooks really brought the PureCadence line back to life. I love this shoe just like I loved the first version and the love happened faster this time (we won't talk about the second version. In fact let's pretend it didn't happen). The combination of responsive cushioning, adaptive full length support, an anatomic last and a moderate weight makes the Purecadence 3 almost a do-it-all shoe! 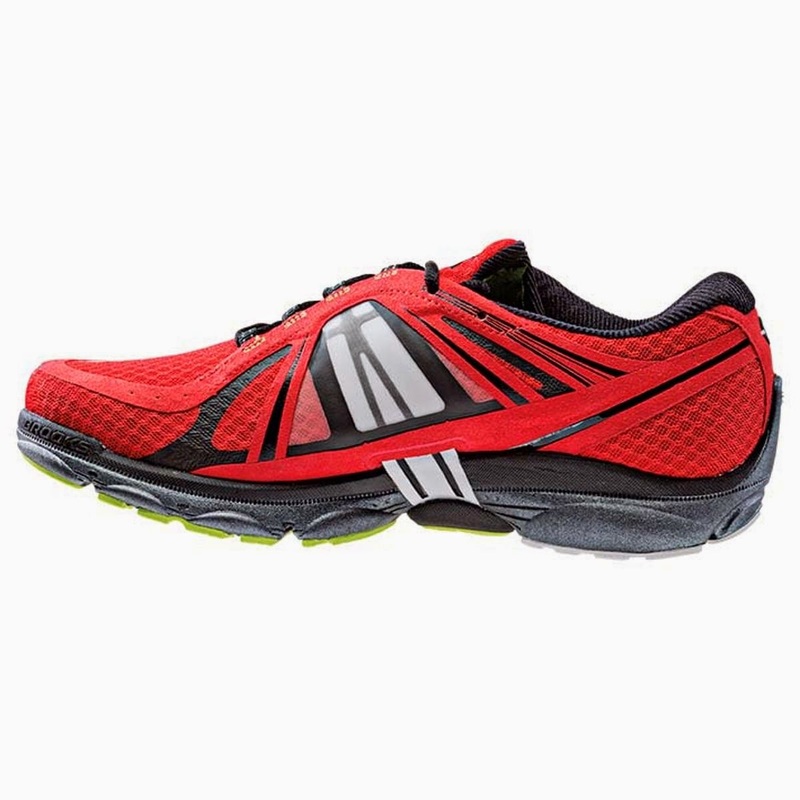 You could use this as a training shoe if you're used to lower drop shoes or could use this as a racing shoe if you train in something like the Brooks Adrenaline or Ravenna. Brooks is doing some really cool stuff between interesting tweaks to the pure series as well as new ideas like the guide-rails in the new Transcend. I am very excited to see where they go because there is some serious envelope pushing and innovation going on!